I picked up a Hobie Revo 13 last week and I wasted no time in getting it rigged up and ready to fish. 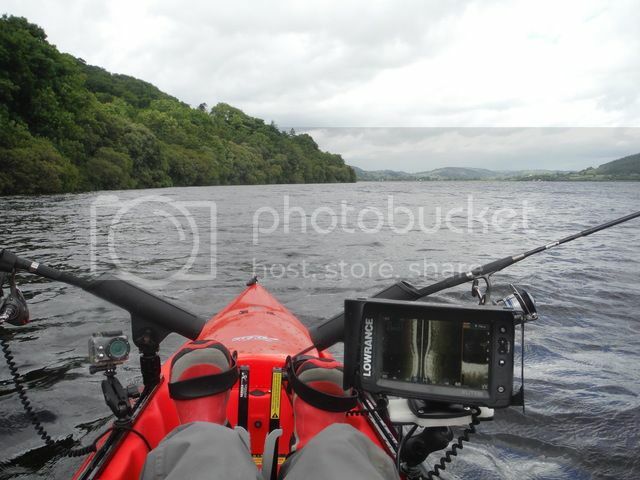 Today was the maiden voyage and I thought it was only fair that her first trip would be on Bala to troll for Pike. After all, the ability to troll hands free was probably one of the biggest selling points for me. 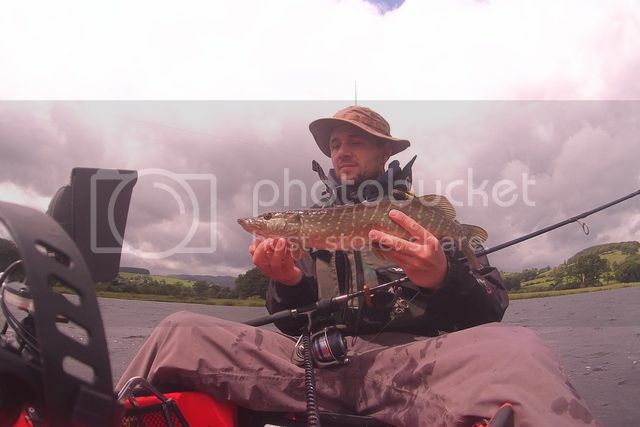 I've fished Bala a fair bit over the last few years and the only fish I've ever caught from Bala was a Ferox trout on my first trip whilst getting back into kayak fishing a few years back. Its a hard water to say the least but the fish so I'm told are pretty and fight hard so worth the effort plus I enjoy a challenge and I can't imagine a better place to blank as the scenery is truly special. At times its felt like I was simply glutton for punishment but I knew deep down the more I blanked the more I wanted it and I was just making inevitable success sweeter. 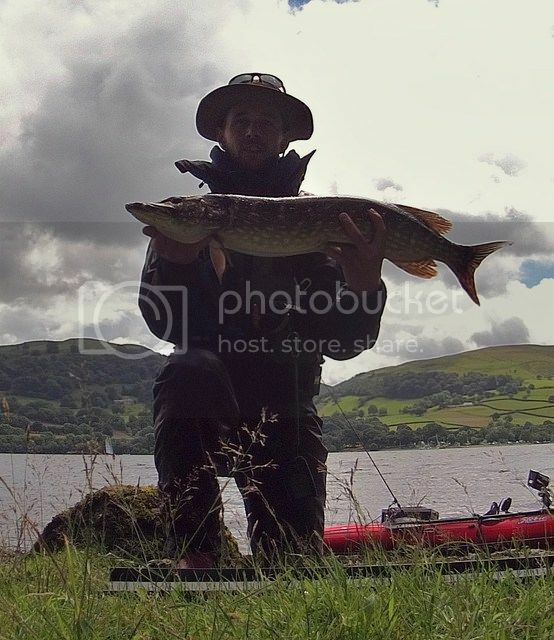 I progressed along the west bank zig zagging between 8 and 15ft and took a slightly better Pike. I could have gone home a happy man. I was half way down the lake when my right rod hooped over and the reel sung our favourite song. 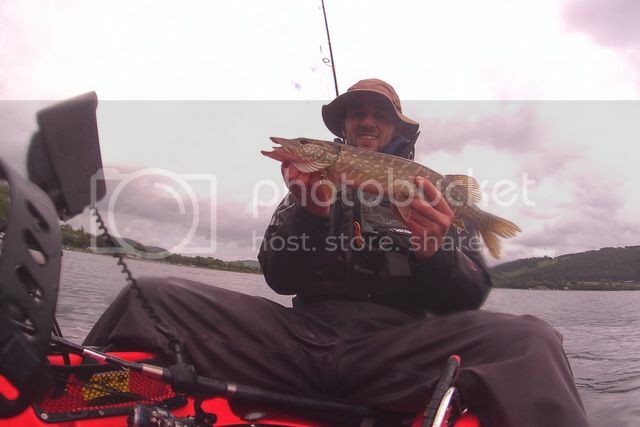 She put up a brilliant fight and made some great runs but Pike number 3 was in the net and my kayak PB at 82 cm happy days, as I was so close to the bank I jumped out for a photo but the photo is rubbish so I'd of been better off in the yak. I didn't have to wait long for fish number 4. 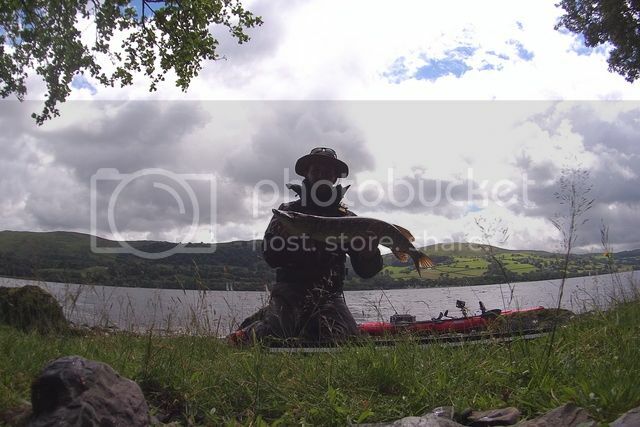 I reached the bottom end of the lake, the area with so much promise on my last visit and I peddled and peddled but it seemed I was wasting my time so I called it a day, just 4 miles back to my car haha I trolled back along the west bank with the hope of picking up another fish or two. Half way back up I hooked a spirited little jack which while being drawn towards the net proceeded to do a somersault seemingly through the rudder and he was away leaving me with a pretty nasty tangle to sort out haha. 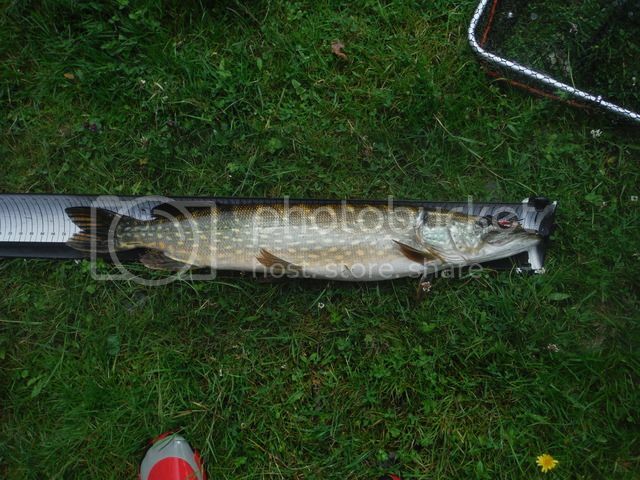 I was almost back to my launch point and had opted to leave the lures in the water as a went through the mouring bouys. 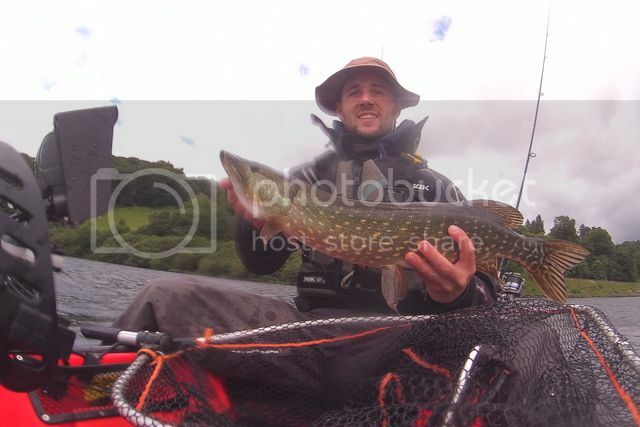 I thought I'd snagged a rope as line was spilling out the reel on the take but it turned out to be Pike number 5 which somehow with only half a tail fin put up a decent fight. 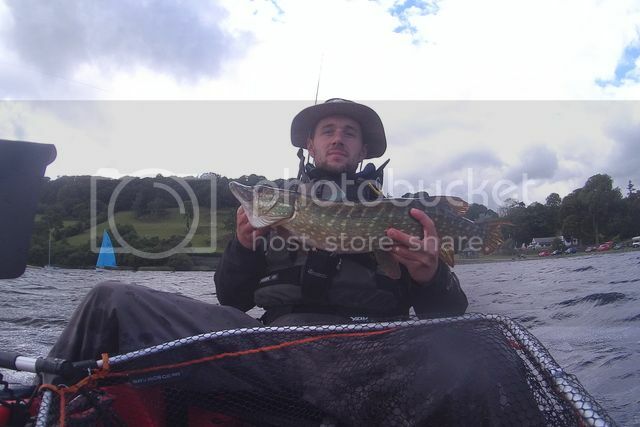 I had a great day afloat and really felt at home on the Revo it's like I've fished from it for years. Its a great advantage to have the ability to maneuver while hooked up whether it be to stop the fish tangling in the other line or to get you out of a tight spot, I just cant believe it took me so long to bite the bullet and go Hobie. On a final note It was finally nice to see some fish landed from Bala and they where everything I had hoped and dreamed for. I'm still on the hunt for a Bala 20 but this has really bolstered my confidence! Next week maybe! 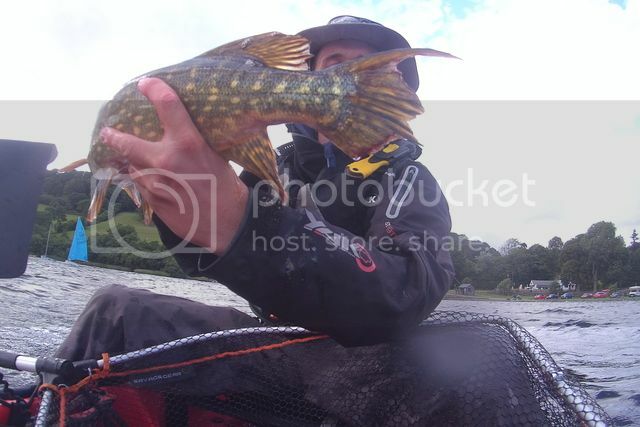 Great report and pics Shaun. Smashed it as usual...top stuff Shaun laaaaaa!